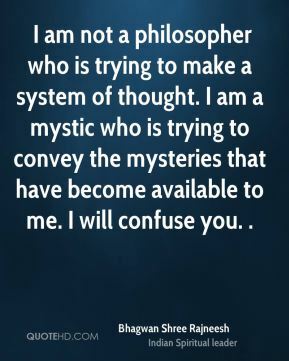 I am not a philosopher who is trying to make a system of thought. I am a mystic who is trying to convey the mysteries that have become available to me. I will confuse you. . If there is pain, use it as an awareness, as meditation, as a sharpening of the soul. And when pleasure is there, use it as a droning, as a forgetfulness. 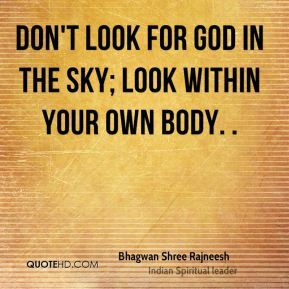 Both are ways to reach God. One is to remember yourself totally, and one is to forget yourself totally. . I have never been a serious person.... I am not serious at all because existence is not serious. It is so playful, so full of song and so full of music and so full of subtle laughter. It has no purpose; it is not business-like. 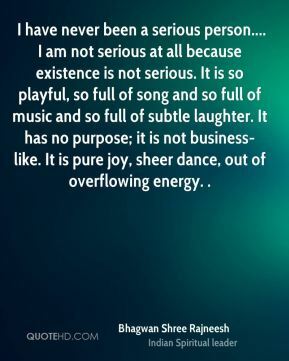 It is pure joy, sheer dance, out of overflowing energy. . I am saying something about the ineffable. I am saying something about the ultimate mystery. You can understand it, yet you can never understand it totally. It is elusive, it escapes. It is within reach, but it is not within grasp. You are always coming closer and closer to it, but you never arrive. 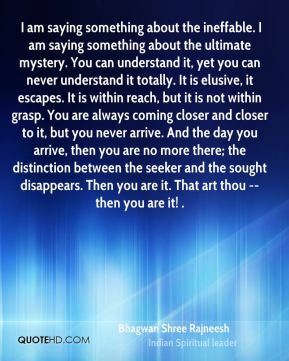 And the day you arrive, then you are no more there; the distinction between the seeker and the sought disappears. Then you are it. That art thou -- then you are it! . Let this become your key - next time when anger comes, just watch it. Don't say, I am angry. Say, Anger is there and I am watching it. And see the difference! The difference is vast. Suddenly you are out of the grip of anger. 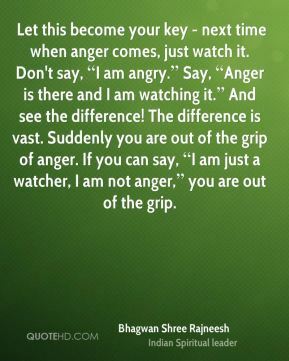 If you can say, I am just a watcher, I am not anger, you are out of the grip. Pleasure is a sort of oblivion, a forgetfulness. Pain is remembrance, you cannot forget pain. 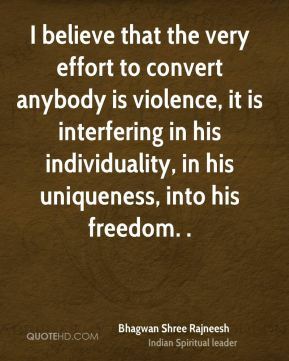 I believe that the very effort to convert anybody is violence, it is interfering in his individuality, in his uniqueness, into his freedom. . 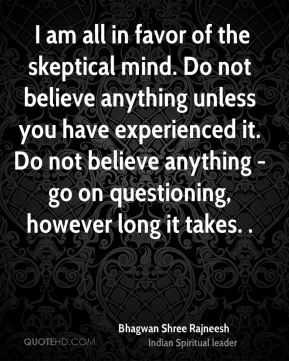 I am all in favor of the skeptical mind. Do not believe anything unless you have experienced it. Do not believe anything - go on questioning, however long it takes. . But the TRUTH is, I AM, therefore I think! 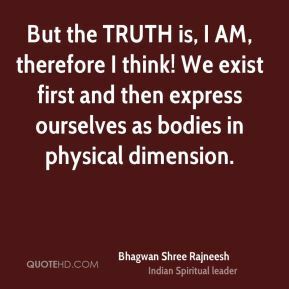 We exist first and then express ourselves as bodies in physical dimension. I would simply like to be forgiven and forgotten. There is no need to remember me. 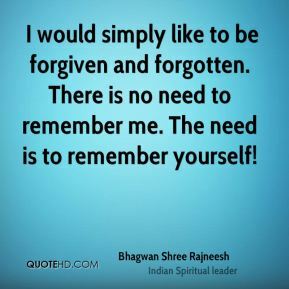 The need is to remember yourself! When sadness comes, just sit by the side and look at it and say, I am the watcher, I am not sadness, and see the difference. Immediately you have cut the very root of sadness. 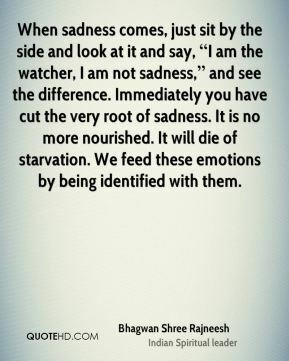 It is no more nourished. It will die of starvation. We feed these emotions by being identified with them. 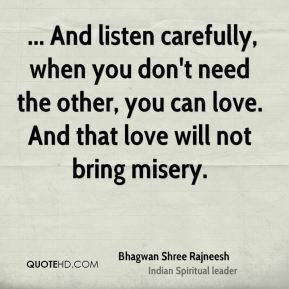 ... And listen carefully, when you don't need the other, you can love. And that love will not bring misery. 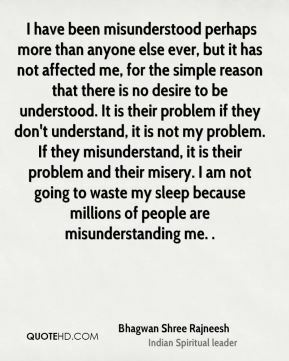 I have been misunderstood perhaps more than anyone else ever, but it has not affected me, for the simple reason that there is no desire to be understood. 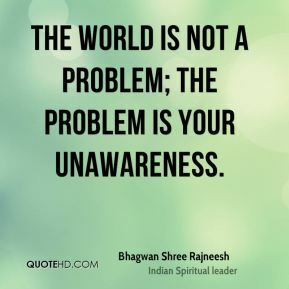 It is their problem if they don't understand, it is not my problem. If they misunderstand, it is their problem and their misery. 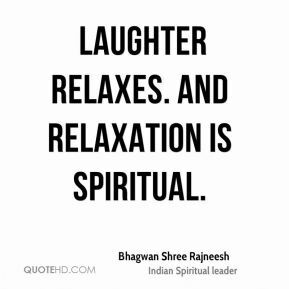 I am not going to waste my sleep because millions of people are misunderstanding me. .
Don't look for God in the sky; look within your own body. .
Laughter brings you to reality as it is. The world is a play of God, a cosmic joke. 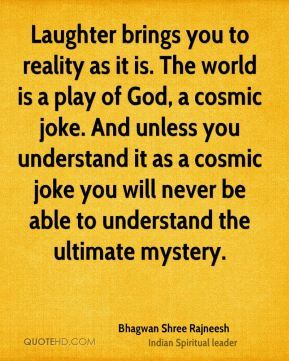 And unless you understand it as a cosmic joke you will never be able to understand the ultimate mystery. The stronger a person's "I" is, the smaller his capacity to become one with anybody. The "I" is a wall in between; it proclaims itself. Its proclaimation is : "You are you and I am I. There is a distance between the two." Then no matter how much "I" love you, "I" may embrace you to my bosom, still we are two. No matter how closely we meet, still there is a gap in between - I am me and you are you. That is why even the most intimate experiences fail to bring people close. Bodies sit close to each other but the persons remain far away. As long as there is the "I" inside the sense of "the other" cannot be destroyed. Sartre has made a wonderful statement: "The other is hell." But he didn't explain why the other is "the other." The other is "the other" because I am "I". 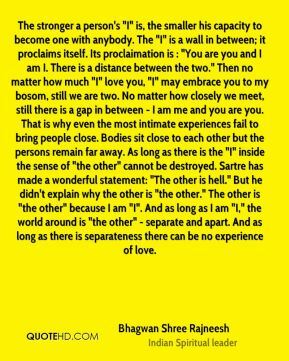 And as long as I am "I," the world around is "the other" - separate and apart. 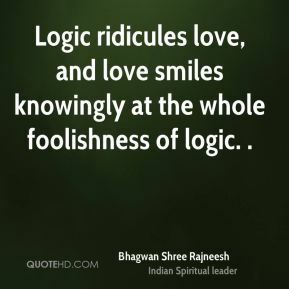 And as long as there is separateness there can be no experience of love. We are all one. 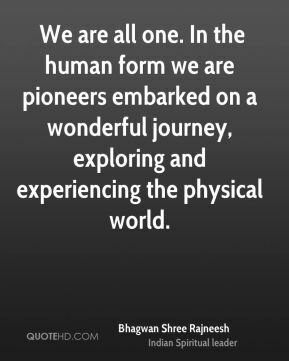 In the human form we are pioneers embarked on a wonderful journey, exploring and experiencing the physical world. 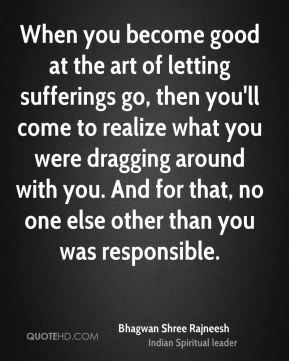 When you become good at the art of letting sufferings go, then you'll come to realize what you were dragging around with you. And for that, no one else other than you was responsible. 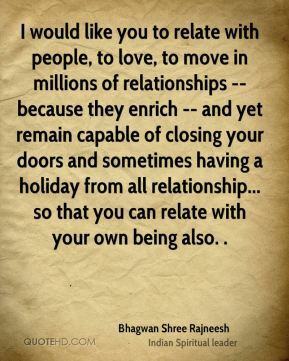 I would like you to relate with people, to love, to move in millions of relationships -- because they enrich -- and yet remain capable of closing your doors and sometimes having a holiday from all relationship... so that you can relate with your own being also. .
You are the watcher; the mind is the watched. 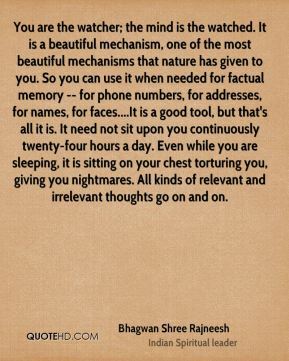 It is a beautiful mechanism, one of the most beautiful mechanisms that nature has given to you. So you can use it when needed for factual memory -- for phone numbers, for addresses, for names, for faces....It is a good tool, but that's all it is. It need not sit upon you continuously twenty-four hours a day. Even while you are sleeping, it is sitting on your chest torturing you, giving you nightmares. All kinds of relevant and irrelevant thoughts go on and on. When you are working in your office, I am not telling you to be a no-mind. 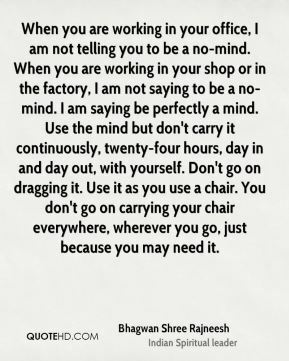 When you are working in your shop or in the factory, I am not saying to be a no-mind. I am saying be perfectly a mind. Use the mind but don't carry it continuously, twenty-four hours, day in and day out, with yourself. Don't go on dragging it. Use it as you use a chair. You don't go on carrying your chair everywhere, wherever you go, just because you may need it. I am nobody's disciple. I don't belong to any belief system. I love people from all over the world and I never compare them. 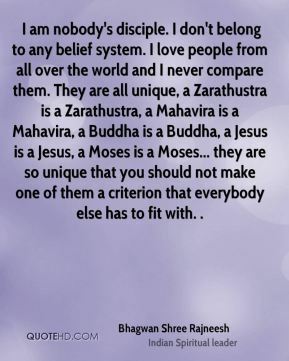 They are all unique, a Zarathustra is a Zarathustra, a Mahavira is a Mahavira, a Buddha is a Buddha, a Jesus is a Jesus, a Moses is a Moses... they are so unique that you should not make one of them a criterion that everybody else has to fit with. .